Twelve-year-old Warren is an orphan. His father died when he was very little and he doesn’t even remember his mother. Warren is being raised by his lazy Uncle Rupert and his dreadful Aunt Anna Conda (and I use the term raised very lightly because Warren does much of the work himself). Warren is living in his forefathers’ legacy, The Warren Hotel, which has been passed down from father to son for thirteen generations. Since Warren isn’t old enough to run it on his own, his uncle has been placed in charge but he’s done a rotten job of maintaining it. To make matters worse, Uncle Rupert’s new wife treats Warren dreadfully. She has exiled him to the attic and she doles out cruel tasks and punishments for our young hero. She only married Uncle Rupert to gain access to the mythic “All-Seeing Eye” which is said to have magical properties and be hidden somewhere inside the hotel. There hasn’t been a customer in years until one day…a mysterious guest arrives. The lone guest has a face covered in bandages and communicates by using pictures on cards. 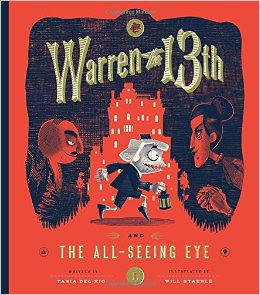 When a deluge of destructive guests arrive out of nowhere to search for the All-Seeing Eye, it’s up to Warren to find the treasure and protect it before it falls into the wrong hands. This middle grade title has eccentric gothic elements that bring to mind titles like A Series of Unfortunate Events and The Incorrigible Children of Aston Place. It has a quirky tone and strange premise that is sure to please kids who enjoy the unusual. There are illustrations are rendered in striking black and red ink on every page and it does so much to set the tone and give the book personality. Honestly, the illustrations add more to this tale than the text, so if you have a child who is drawn to visually stimulating books, this is the one for you.